Farm plastic and veterinary treatment waste collected direct from NI farms. Complies with all Farm Quality Assurance Schemes and waste regulations. 3 different plastic waste streams recycled. 3 different veterinary treatment waste streams safely disposed. Low cost and environmentally secure options. Established in 2005, and providing plastic recycling and veterinary treatment waste disposal services to thousands of farmers across NI. 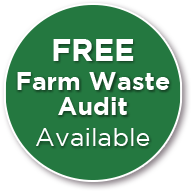 The NI Farm Waste Compliance Scheme in conjunction with your business, will ensure the safe and secure recycling or disposal of your farm waste. Farm plastic that cannot be prevented, can be collected for recycling. Recycling is the preferred option to disposal. (Recycling examples could include the triple rinsing of chemical drums, so that they can be recycled rather than needing to be disposed of as hazardous waste) Please visit our recycling pages for further information. Finally, a small amount of farm waste cannot be prevented or recycled. Part of this is classified as hazardous waste, and can be collected and treated for disposal. This is mainly in the form of empty veterinary treatment packs, sharps, syringes, aerosol cans or contaminated PPE. Please visit our veterinary treatment waste page for further information. Emerald Isle Recycle operates a reliable, low cost service for the recycling of waste farm plastic, and disposal of veterinary treatment waste, to thousands of farms and businesses across Northern Ireland.